Open DataLog and observe that there are four sections to the window. The upper left section shows the directory of the My Sales folder(s); the lower left is a section for Tools. 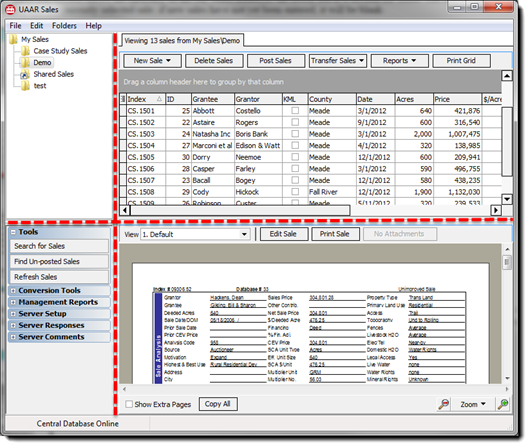 The upper right section is a customizable sales “grid” or list of the sales in the selected folder; and the sale viewer is the lower right section. It displays the currently selected sale; if new sales have not yet been entered, it will be blank. It is important to decide how to organize the sales folders for the local directory. All users must keep the root folder named My Sales. Though not required, many users create sub-folders by county; some keep a sub-folder for shared sales that is identified by sender name. 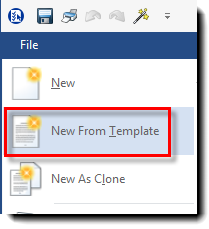 Create and name a folder if desired by R-clicking on the My Sales Folder or by clicking the Folders button on the menu bar at the top of the screen. Add new folders as preferred. To create a new sale, click on the folder where the sale will be stored. In the sales grid, choose New Sale→New Blank Sale. In the Sale Analysis area of the new sale check Improved/Unimproved as appropriate. Tab through the cells to enter sale data such as grantor, grantee, acres, price, etc. When you enter data into certain cells such as Sales Price, you will see other cells populate automatically with data, i.e. CEV Price. Be sure to enter the SCA (Sales Comparison Analysis) Unit Type and Effective Unit Size. Acres and Total deeded acres are most common, however, in cases where sales are not driven by acres, other units of measure such as AUMs, board feet, barrels, etc., may be used. For most cells, a drop-down menu of responses can be created. Note: When “mousing” over certain cells a padlock icon is seen. This indicates that the cell is “locked” by the software so that automatic calculations occur. To manually change a value for a locked cell, simply click the padlock to open it and make the change. The font color will be red as a reminder that the cell is unlocked and a value was entered manually. The red font does not show on printed sales or reports. Click again to restore the default value. Complete the Land Mix Analysis next. Creating a land table helps ensure consistency that is important to the Sale Comparison Approach pages in ClickForms. 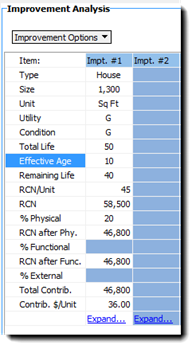 To create a land table, enter the desired land uses and their corresponding ratios into the Land-Mix Analysis grid as seen above. The first true land row MUST include a ratio of 100 in order for the software to work properly. Remaining rows’ ratios are entered. The $/Acre value for the first land row for an IMPROVED sale only is determined by the appraiser and must be entered prior to calculation of land values. See notes A and B below for explanation. Click Select List→Add (see #1 above) and enter a name for the list if the list is to be saved for future use.Saved Lists are integrated with ClickForms! Once the land list is completed, click the Calculate Land Values Button (see #2 in image above) to compute the Total Unit Values and the remaining values in the Land-Mix Analysis section. It is important to note that for those rural residential sales that will be used specifically in the UCRR report format in ClickForms, the site must be listed in the first row as seen below, so that when the sale is transferred into ClickForms the UCRR forms will work correctly. This means that the first true land row with a 100% ratio is the second row of the grid! Ratios are developed by the appraiser from puritan sales, productivity data, and rent data. They represent the relative value between the land types. 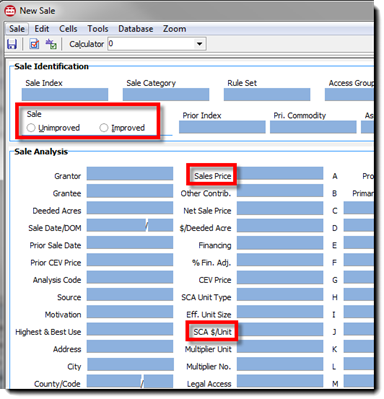 As previously described, the user must set the $/acre value for the first row only for an improved sale; this step is omitted with unimproved sales. The software will calculate the $/acre when the Calculate Land Values button is clicked in either case. Ratios, Acres, and $/Acre are for use with acres. The “Unit” columns are for use with non-deeded land that may be attached to the sale, or AUMs, or permits, etc. Do not enter deeded acres in these columns. DataLog extracts the value of the land from the CEV price, leaving a residual amount for improvements. UNIMPROVED SALE: Input the number of acres for each of the land types; then click Calculate Land Values. 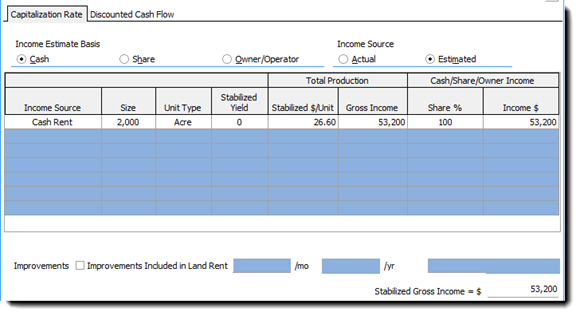 The $/Acre and Total Unit Value columns fill with data. The final $/Acre reflects the land/mix ratios for the list used. A $/Acre value for each of the land types must be determined, even though the sale may not include all of the types of land. This is important because the subject may have land types that the sale does not. The land/mix ratios should be reviewed and adjusted periodically to match market conditions. Using land lists ensures consistent data entry, and critical for the software calculations to work properly. IMPROVED SALE: Enter the desired $/Acre for the first land mix row. (This value should be extracted from unimproved, puritan sales.) Next, click Calculate Land Values. It is important to remember that the residual contribution goes to the improvement/s, not to the land. A Cash Rent is used in this example. Pasture Rent is the income source, and is for 2,000 acres. The Stabilized $/Unit is $26.60 and the share is 100%. The software calculates the income as $53,200. List expenses like insurance, maintenance, management costs, and taxes as needed. Once the net income for each comparable sale is estimated, it is divided by the sale price of the property to develop an overall capitalization rate for use in the income approach. There is room for up to twenty improvements for the sale. Input the information about an improvement in the tab order (top to bottom), for as you move from cell to cell, the values for effective age and remaining life will calculate and update automatically. For example as below left, enter data for a house of 1300 s-f with good utility and condition. With Total Life of 50 years, RCN/Unit of $45, and Physical Depreciation of 20% entered, the software will calculate the remaining life as 40. The improvement contribution is already known because it is based on the Land Mix Analysis; it is copied to the bottom of the improvement grid to allow the user to see the difference between the total entered improvement contribution and the known contributory value. Adjustments to depreciation are made until these two values match. The appraiser must decide how the depreciation is to be allocated among the improvements and to what degree the depreciation is physical, functional, or external. See a video about Depreciation Options. There is an optional link at the bottom of each improvement to create an expanded Improvement Detail analysis page. Choose the type: Generic or House. For House, the house-specific data points will transfer into the UCRR Sales Comparison Approach page in ClickFORMS. 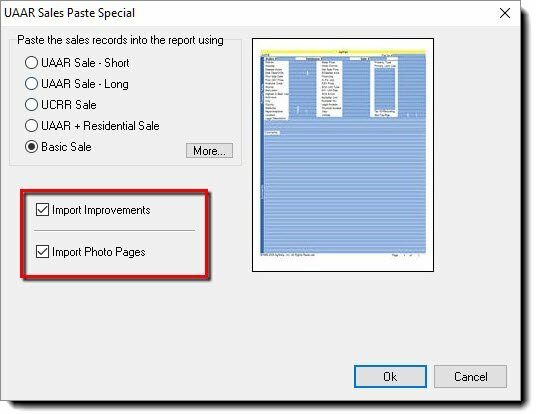 Improvement Detail pages do transfer into a report with the sale. 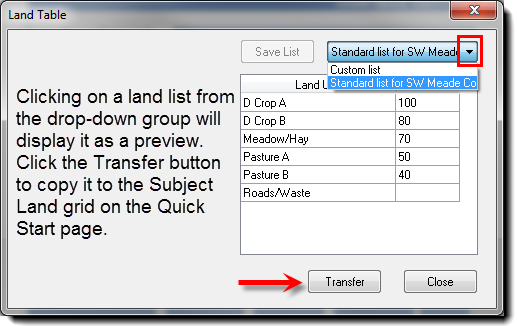 An Attribute List is created in the same manner as a Land List. When the expanded improvement page is in view, the Attribute List is empty. Enter the attributes for the improvement in the appropriate cells. To save the list for future use, click the drop-down arrow and choose Add and name the list. The Photo Pages allow the user to embed jpeg images and PDF exhibits in the sale. This means that Photo Pages move with a sale when it is transferred into a report. The Comments and Attachments Sections are located at the bottom of the sale sheet. There are four tabbed pages for a variety of comments options. The first three tabs are for comments that the appraiser wants to include not only in the sale file, but on the corresponding pages in a future report. For example, comments included on the Sale Sheet tab will migrate onto the actual Sale Sheet page of a report in ClickForms when the sale is pulled into a report. Comments entered on the General tab stay with the sale. If the appropriate forms are included in the ClickForms report, the Sales Comparison and Cost Approach comments pages will transfer to them. Attachments do not automatically migrate into a report because they are not embedded into a sale. They are merely contained within the attachment window for the user’s convenient access. Caution: Two numbers can identify sales in DataLog. When a new sale is saved the software automatically assigns a Database ( D or ID) number to the sale (1, 2, 3…). This number is not meant to be used as an appraiser’s reference because it is not permanent. There is a cell for an Index (I) Number in the upper portion of the sales sheet. This is for a user-preferred internal numbering system that a standard license user can create. * Many users opt for something like “2014-M13-001”, where the year is first, the “M13” is a county code and “001” identifies this as the first sale written for the year 2014 in that county. The software never changes I-numbers. The I number must ALWAYS be unique for each sale and is assigned manually by the standard license user. It can be a mix of letters and numbers. *Enterprise licensees use the “Get Index” option in DataLog. The DataLog default process saves changes to the sale automatically upon exiting/closing the sale. A message appears on screen as a reminder that changes are being saved. To exit a sale without saving any changes, choose Sale→Close Sale without Saving. See the section on Mapping. NOTE: REPEAT STEPS 1-2 FOR EACH SALE YOU ARE USING IN THE APPRAISAL. NOTE: This tutorial document addresses the process for creation of a basic agricultural appraisal report. For information on special formats like UCRR, unique considerations such as permanent plantings, etc., please use the search tool at the top of the User Manual window, or click on hyper-links found throughout this tutorial as well as the remainder of the User Manual. With ClickForms open, click the eagle head button in the upper left corner and click New From Template. 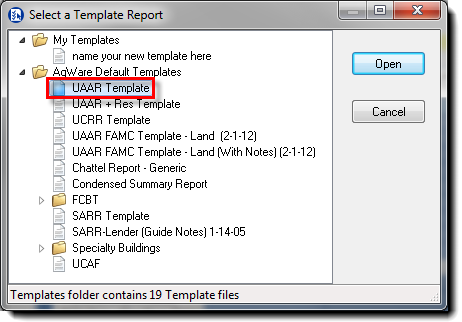 A commonly used report template is the UAAR Template. Delete any unwanted pages from the report by using the red X button on the Forms Manager tool bar. Many appraisers eventually create custom templates. The Quick Start Page is almost always the first form in an AgWare ClickForms appraisal. Be sure to indicate both the SCA Unit Type and effective size on this page because they transfer to the approach pages, adjustment pages, and the reconciliation page, to list a few. As noted previously, the unit type is most often but not always acres. The effective unit size matches the subject Total Deeded Acres. The Effective Date of Appraisal is needed for time adjustments calculations. To import a Land Table for the subject, recall that you created a land list in DataLog. These automatically migrate into ClickFORMS. With your report open, click the Land Table option from the Lists group on the Home tab of the ribbon. Click the drop-down arrow to view a list of the tables. Choose the one you need and select Transfer. The table will drop into the Subject Land Types section of the Quick Start page and into some other pages also. If you haven’t already done so, enter remaining subject information into the Quick Start page. In DataLog select the desired sale/s and click Transfer Sale→Copy Sales to Clipboard. Switch back to the report in ClickForms, click Paste Special. If you want improvements and photo pages from sale, be sure the boxes are checked. 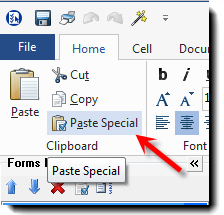 Any time you paste/paste special a sale, it drops in at the bottom of the Forms Manager list. Rearrange the sales pages in the list using the up/down arrows at the top of the list, or use the drag/drop method, to put them in preferred order, top-to-bottom. To quickly renumber them now that they are in order, click the Auto Number Sales option on the Tools tab. Doing this enables the reader/appraiser to easily identify the sales used in the approaches because they will be labeled this way in the Table of Contents and the Forms Manager. This is also how ClickForms knows which sale is which! Assigning numbers to sales pages this way in a report changes NOTHING about the sales in DataLog. The upper part of a sale sheet is shown, with its new internal identification as Sale # 1 in the report. The appraiser could manually insert this number on each sale sheet separately, but the Auto Number button is a one-click effort. The sales need their new (internal) report numbers prior to step 6! For approach pages such as the Sales Comparison Approach shown above, enter the sale number in the desired data column and press the enter key. The corresponding sale’s data automatically migrate into the approach page. In other words, you are “informing” the software that the data for sale #1 should be transferred into the approach page(s) as sale #1 into whichever column you want. The typical assumption is that if you labeled a sale as sale #1, you want its data placed in the first column. An obvious exception is when there are more than 5 different sales to be used for multiple approaches. So sales #6-8 for example, might be in the 1st-3rd columns on the Cost Approach page, while sales #1-5 are used only for the Sales Comparison Approach. 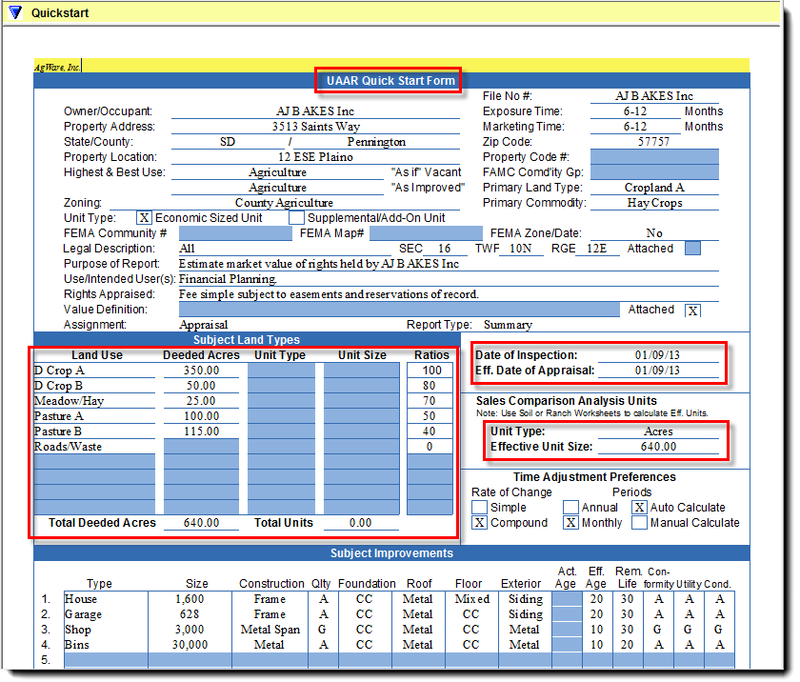 Sales Adjustment pages are unique to each sale and they must be included in the report in order for calculations to work properly. Once the sales are transferred into the approach page, the adjustment pages will automatically update the Land Adjustment portion. The appraiser must manually enter some data for the Improvement Adjustment portion for improved sales. Complete the approach pages, write the comments, do the summary and reconciliation, etc. Complete the finishing touches for the report. Add maps, documents, etc. (details in the User Manual). Check the page order, print quality, numbering, etc. Affix a digital signature if desired. Be sure to save the report with a meaningful and concise file name: Apples to Oranges – 2015 for example, with seller to buyer last names and year completed. Best practice is to omit using punctuation marks for file names; hyphens are OK.
Print, create a PDF, or email the completed report. Congratulations!